How do I issue Restricted Stock? Restricted stock is generally common stock that is subject to repurchase or forfeiture based upon certain contractual conditions being met. Most often, these conditions are that the stockholder continue to be an employee or officer of the corporation that issues the stock. You can issue Restricted Stock using Gust Equity Management by following the steps below. First you want to get to the detailed view of your cap table. You can do this by clicking on CAP TABLE near the top of the screen and then click on DETAIL. You can also get to this page by clicking on VIEW CAP TABLE which is in the top right corner of your Ownership tile on the dashboard page. Then you want to click on ISSUE which is located near the top right of the screen right below contacts, and directly to the left of new security. You then want to click on SHARES from COMMON. You then should see a page where it asks you to enter the Shareholder's name and details regarding the shares being issued. 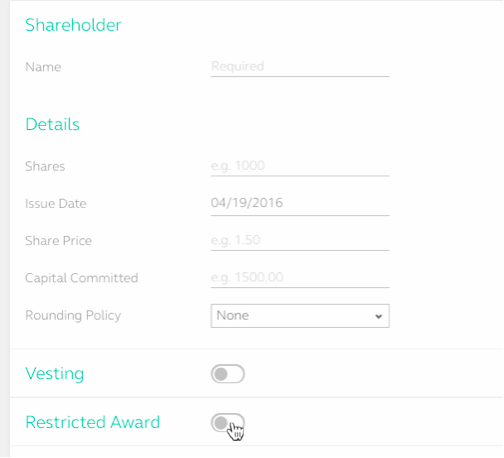 You want to toggle on Restricted Award if you are issuing restricted stock. This is right below Vesting. Once you toggle on Restricted Award you will then be able to select the where you are wanting the Restricted Stock to be issued from. In this example below the Restricted Stock is being issued from the Option Pool that the company has. You can also do this while in 'BULK' view if you are entering multiple shareholders at the same time. If you scroll to the right in 'BULK' view you will see UNDERLYING SECURITY (Restricted Award) as one of the options at the top. 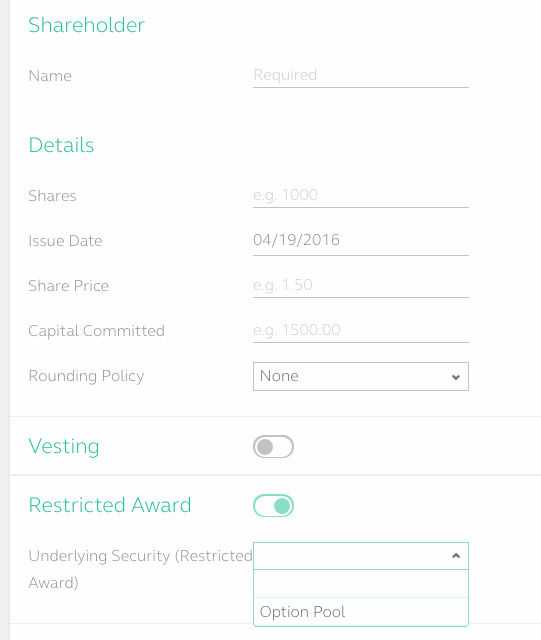 If you click on that field for a shareholder you can then choose where to issue Restricted Stock from.